Boxes, pallets, containers, cars trucks. Dry Ru Roll - Antiperspirant deodorant with high qualities. The Dry Ru Roll is a reliable aid in dealing with normal and excessive sweating (hyperhidrosis), as well as stressful situations. It is recommended to apply the product to armpits, palms and feet. One bottle, on the average, lasts for ten months. The Dry Ru Roll’s action is based on the interaction of aluminum chloride hexahydrate with the skin’s proteins, which results in the formation of aluminum-protein complex that ensures the narrowing of the sweat ducts. The product’s formula guarantees the safety of its use. Aluminum chloride hexahydrate neither dissolves in the pores, nor enters the organism and affects the functioning of internal organs or body systems. Aluminum-protein formations are completely removed from the body after the product’s use. The functions of sweat glands are not disturbed; there is a balanced redistribution of sweating through the pores of the other areas of the body. When using the Dry Ru Roll in accordance with the present instructions, you can be assured in full comfort during the long period of time. The Dry Ru Roll should only be applied in the evening before going to bed. Since at night the sweat glands are less active, the Dry Ru Roll is able to fully activate its properties. Before applying the product, the areas of application should be washed with cool water and soap, and then carefully dried. If need be, in cases of extreme hyperhidrosis, it is recommended to dry the skin with the blow dryer. 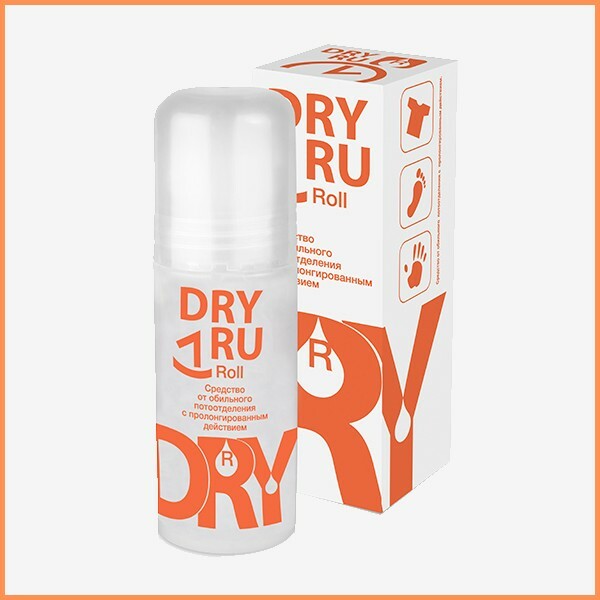 Do not apply the Dry Ru Roll to moist, partly moist, irritated or damaged areas of the skin! After applying, allow 3 to 4 minutes for the product to dry; if necessary, you may dry the area of application with the blow dryer. Do not wash! In the morning, it is recommended to follow your usual hygiene procedures. It is recommended to apply Dry Ru Roll as the need arises, normally 1 to 2 times per week. In the initial phase of the use, daily application is possible. After achieving the 70-80% reduction of sweating, it is recommended to gradually increase the intervals between treatments. to the duration and frequency of use of the product. Recommendations for applying the Dry Ru Roll to the armpit areas. Evenly apply the product to the dry skin in the armpit areas. To prevent irritation, allow the product o dry and wait until the alcohol evaporates from the area of application. It is recommended to sleep in a cotton dress that covers the armpit areas in order to preserve the product on the skin. Evenly apply the product to both palms and wait until the alcohol evaporates. It is recommended to wear cotton gloves during the night in order to preserve the product on the skin. 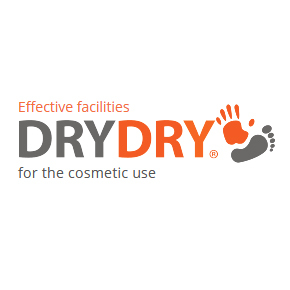 Recommendations for applying the Dry Ru Roll to the feetEvenly apply the product to both feet and wait until the alcohol evaporates. It is recommended to wear cotton socks during the night in order to preserve the product on the skin. Avoid contact with eyes. In case of the product’s contact with eyes, rinse with plenty of water. It is not recommended to apply the Dry Ru Roll within 24 hours after removing the hair from the respective skin area. Do not apply to the irritated or damaged skin. In case of burning or itching sensations, wash the product off with water. The intervals between the applications of Dry Ru Roll should be no less than 24 hours. Keep out of reach of children! Do not use Dry Ru Roll near a naked flame. Persons under the age of 16 as well as pregnant and nursing women should consult with their physician before using Dry Ru Roll. Colorless, transparent liquid, with no odor. Term of validity is written on the package. Keep only in the upright position, in a titghtly closed original package, in a dry place with a temperature of +5 °C to +25 °C.